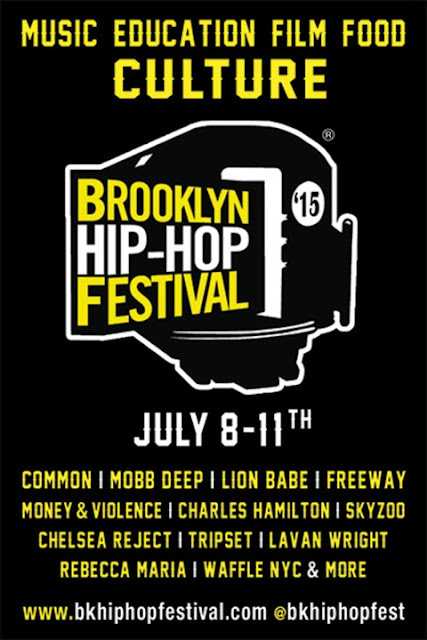 The 2015 Brooklyn Hip Hop Festival takes place this week, Wednesday (7/8) through Saturday (7/11), and new updates were recently announced. The annual Brooklyn Bodega-presented festival begins with a "conference on Hip-Hop, Technology and criminal justice reform" on Wednesday, followed by a screening of 1994's Fresh on Thursday. Friday has a tour of Brooklyn bars and restaurants, courtesy of Brooklyn Brewery, and the JUICE Hip-Hop Exhibition at Littlefield with a dance-off, various showcases, and galleries. Then as always, the main event is the big concert happening Saturday at 50 Kent. As mentioned, Common is headlining this year. Since we last spoke, they added Queensbridge legends Mobb Deep, plus Lion Babe, Freeway, Charles Hamilton, Skyzoo, DJ Rob Swift, Mista Sinista, Pitchblak Brass Band, John Robinson & PVD, DJ Parler, Uncle Ralph McDaniels, Torae, Chelsea Reject, Slim Dollars, Tripset, Waffle NYC, Money & Violence and more. Tickets are still available, and you can also try to win a pair. Lion Babe, who appear on the upcoming Disclosure album, are also playing Afropunk Fest and an Afropunk-presented Lincoln Center Out of Doors show. You can watch the video for their Pharrell-produced single "Wonder Woman" below.